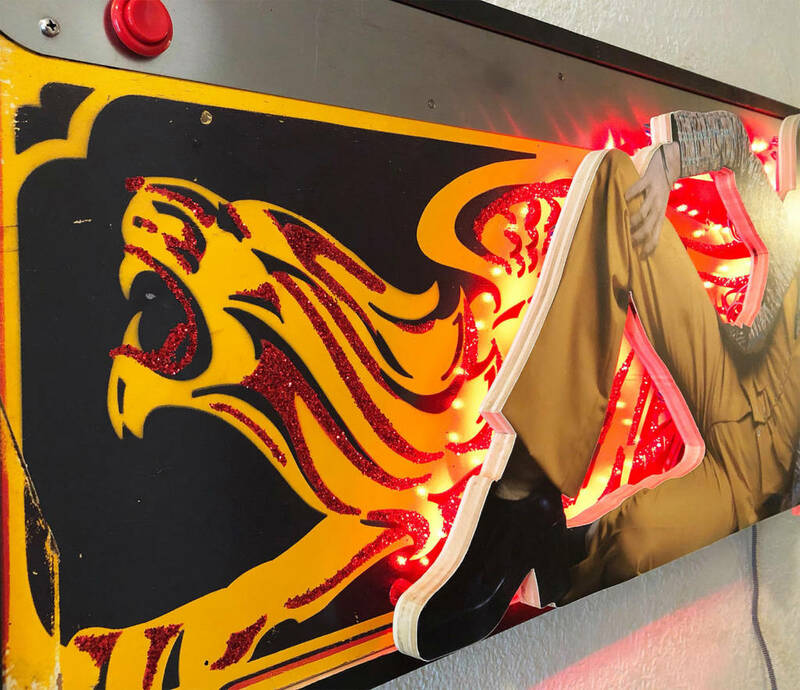 A new art exhibition opens later this month, which brings together pinball design and a series of iconic figures from popular culture over the past sixty years. 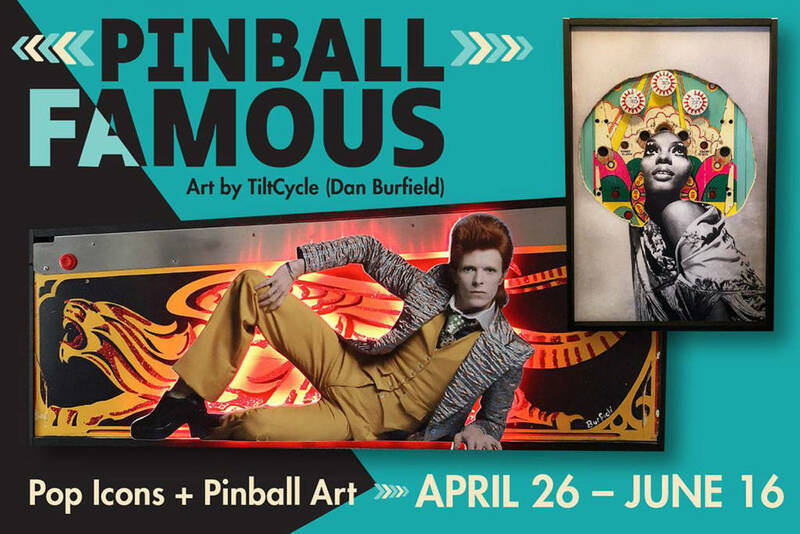 Pinball Famous is a show created by Dan Burfield who has been involved in pinball for the best part of two decades and had previously used assorted pinball elements in his works. 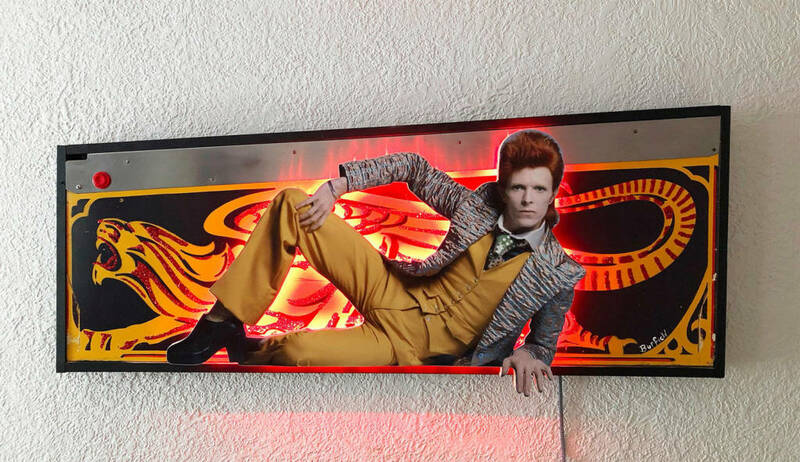 In his latest exhibition he has taken imagery of musicians, actors and models, as well as renowned fashion brands, compositing and layering them with pinball playfields and artwork. Dan Burfield’s latest show is called Pinball FamousPinball Famous is being shown at The Artsmiths of Pittsburgh gallery in Pennsylvania for three weeks, beginning on 26th April with a drinks reception offering the chance to meet Dan and play a The Lord of the Rings pinball brought in for the occasion. Dan told us how he created the first two pieces last November, after which the gallery director invited him to put on a show there. 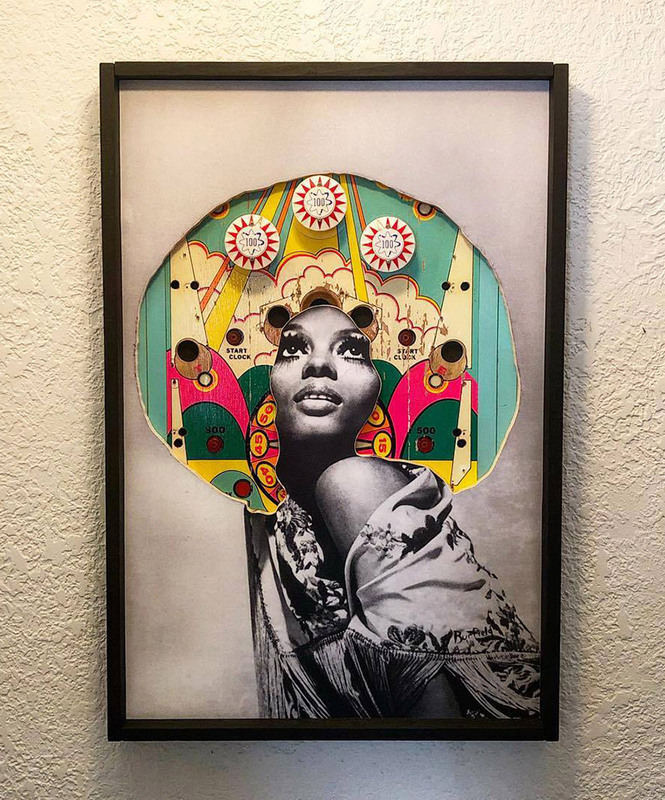 “The gallery is over 100 feet of wall space so I decided to expand the series to fourteen pieces“, he said. The pop-art personalities featuring in Dan’s works are: Twiggy, Diana Ross, The Rolling Stones, Dolly Parton, Ziggy Stardust, Audrey Hepburn, Lady Gaga, Cher, Lost Boys, Valley of the Dolls, Pam Grier, Isabella Rossellini, BVLGARI and Tiffany & Co.
Diana Ross matched with a Williams Travel TimeIf Audrey Hepburn had been such a big hit, how did he select the thirteen other celebrities and brands to appear alongside the actress? Dan picked a number of his personal favourites as well as icons who have stood the test of time. 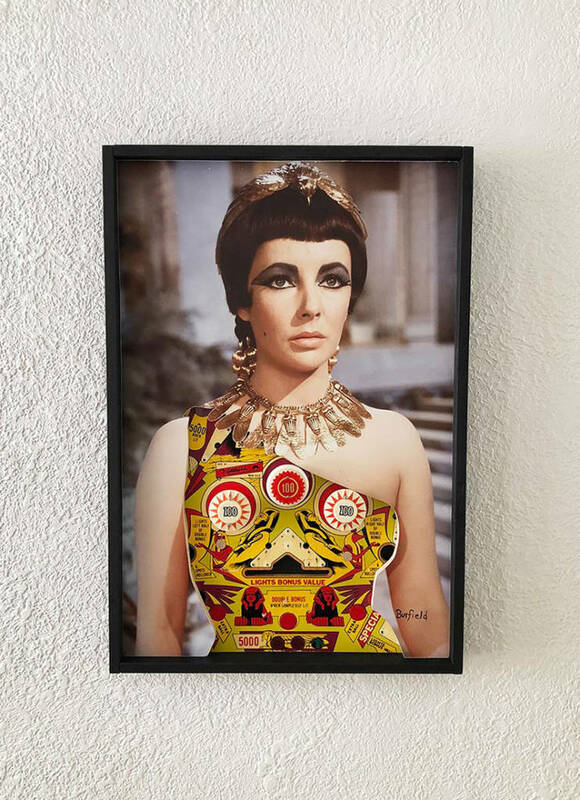 Elizabeth Taylor ‘wearing’ a Cleopatra playfieldOpening night for Pinball Famous is Friday 26th April at The Artsmiths of Pittsburgh Arts & Cultural Center, with the launch party taking place from 6pm until 8pm. Thereafter, the gallery is open from 11am until 5pm Monday to Saturday, and Midday to 4pm on Sunday. Entrance to the exhibition is free. Dan has a long-standing working relationship with The Artsmiths of Pittsburgh, having exhibited there for the past two years. The works in the Pinball Famous show are also available to purchase, but Dan is happy to allay any worries about usable games being destroyed so they can become part of his art pieces. If you can’t make it to experience Pinball Famous during its seven-week run, there are other opportunities to see Dan’s work. He has a charity event at Penn State University, New Kensington Campus on July 14th featuring an art auction and some of his lighted playfields. You can also see his work on Instagram, Facebook and on his TiltCycle website.